It has been quite a while since I have done any kind of print design. 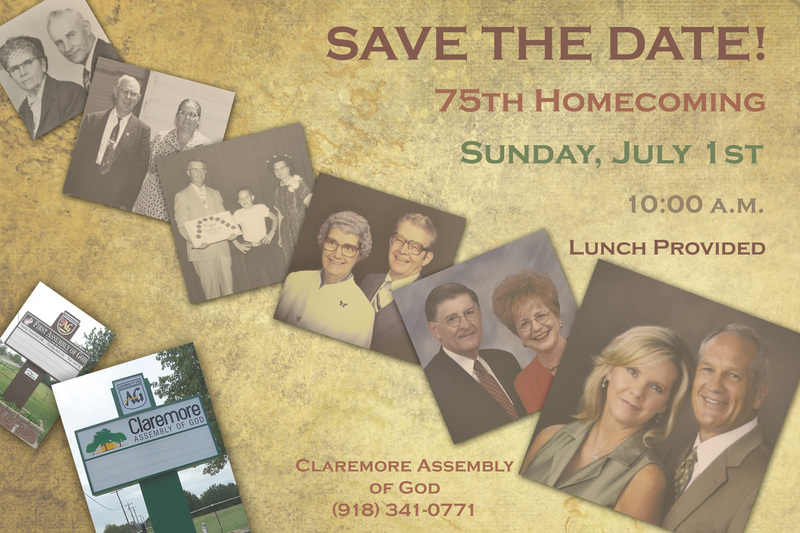 However, when I was approached about doing a “Save the Date” postcard for the church’s 75th Homecoming celebration, I was happy to say yes. After years of working on pages for the Yearbook in high school, as well as everything I have taught myself on Photoshop this past year by reading blog after blog and tutorial after tutorial, I knew I probably had the know-how to throw something together. I was given the idea of having the pictures of previous pastors going from corner to corner. They also wanted pictures of the old and new church sign, as well as the information for the Homecoming celebration itself. I wanted to keep with the overall feel of a Homecoming celebration, so I made the pictures sepia and chose a texture for the background that would have a “homecoming” feel. This is what I came up with. I know there are a lot of professional design people out there who have a much better understanding of Photoshop and everything else that goes into the design aspect of multimedia. However, I must say that, as a first attempt after a long period of not doing anything like this, I am pretty excited about how these turned out. Hoping to add more to my portfolio (as well as more blog posts!) in the future in the design and media category! They were very nice! You are quite talented and I appreciate what you bring to our lives with your skills!